Microsoft products come with a standard set of fonts, and you probably have your favorites. But did you know that there’s a whole world of different styles out there that are free and easy to use in your documents and presentations? FontSquirrel is a site that collects high-quality fonts which are available to download for free. 1. Check to see that the font is a True Type Font (TFF). 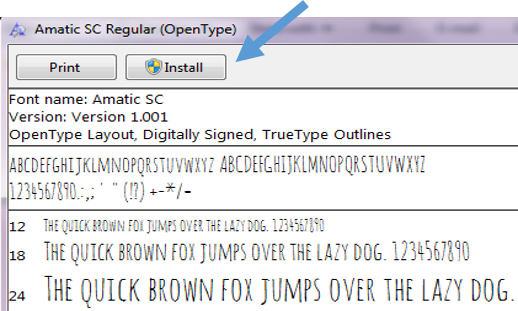 True Type Fonts are more likely to work properly when embedded into Microsoft files. 2. Click the Download button below the font. The font files will download as a zip file. 2. Once the download is finished, double click on the font file and the file will open. Click on Install at the top of the window. You may be presented with files for Regular, Bold, Italics, or other versions of the font. Each one must be installed separately if you want these options. 3. The next time you open Word, PowerPoint, or any other Microsoft product, you can choose the new font from the list. 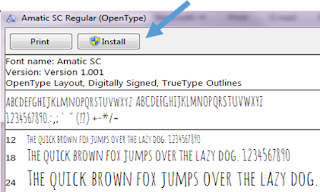 Note: If you use a custom font and plan to open the file on another computer, you must embed the font in the file. Directions for this process can be found here. In my experience, there are some True Type Fonts that will not embed correctly. It’s best to test the process by embedding the font and opening the file on another computer before you attempt to use your presentation in class. If you want to learn more about fonts, visit us in the CTE or email Meg Elias at clarkm1@star.lcc.edu.